Income from oil and gas production doesn’t always trickle down to landowners, as companies find ways to minimize the share they pay in royalties. Don Feusner ran dairy cattle on his 370-acre slice of northern Pennsylvania until he could no longer turn a profit by farming. Then, at age 60, he sold all but a few Angus and aimed for a comfortable retirement on money from drilling his land for natural gas instead. It seemed promising. 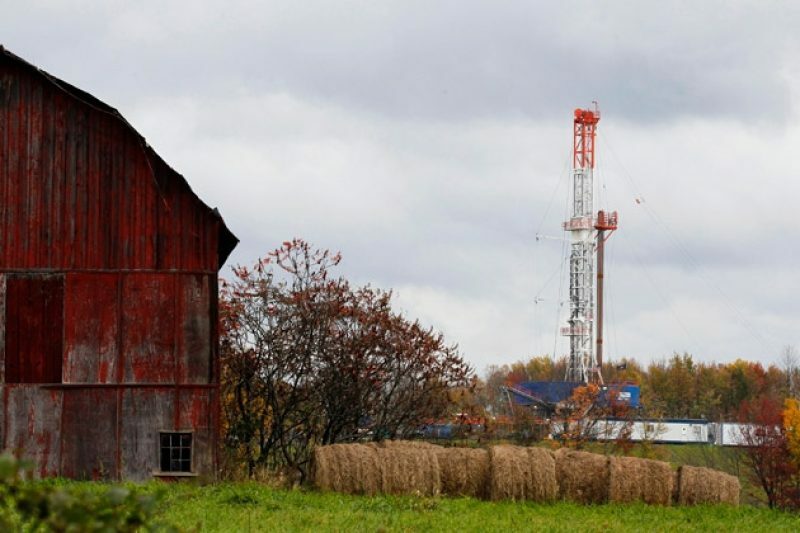 Two wells drilled on his lease hit as sweet a spot as the Marcellus shale could offer – tens of millions of cubic feet of natural gas gushed forth. Last December, he received a check for $8,506 for a month’s share of the gas. Then one day in April, Feusner ripped open his royalty envelope to find that while his wells were still producing the same amount of gas, the gusher of cash had slowed. His eyes cascaded down the page to his monthly balance at the bottom: $1,690. Chesapeake Energy, the company that drilled his wells, was withholding almost 90 percent of Feusner’s share of the income to cover unspecified “gathering” expenses and it wasn’t explaining why. Like every landowner who signs a lease agreement to allow a drilling company to take resources off his land, Feusner is owed a cut of what is produced, called a royalty. In 1982, in a landmark effort to keep people from being fleeced by the oil industry, the federal government passed a law establishing that royalty payments to landowners would be no less than 12.5 percent of the oil and gas sales from their leases. From Pennsylvania to North Dakota, a powerful argument for allowing extensive new drilling has been that royalty payments would enrich local landowners, lifting the economies of heartland and rural America. The boom was also supposed to fill the government’s coffers, since roughly 30 percent of the nation’s drilling takes place on federal land. Over the last decade, an untold number of leases were signed, and hundreds of thousands of wells have been sunk into new energy deposits across the country. But manipulation of costs and other data by oil companies is keeping billions of dollars in royalties out of the hands of private and government landholders, an investigation by ProPublica has found. An analysis of lease agreements, government documents and thousands of pages of court records shows that such underpayments are widespread. Thousands of landowners like Feusner are receiving far less than they expected based on the sales value of gas or oil produced on their property. In some cases, they are being paid virtually nothing at all. In many cases, lawyers and auditors who specialize in production accounting tell ProPublica energy companies are using complex accounting and business arrangements to skim profits off the sale of resources and increase the expenses charged to landowners. Deducting expenses is itself controversial and debated as unfair among landowners, but it is allowable under many leases, some of which were signed without landowners fully understanding their implications. But some companies deduct expenses for transporting and processing natural gas, even when leases contain clauses explicitly prohibiting such deductions. In other cases, according to court files and documents obtained by ProPublica, they withhold money without explanation for other, unauthorized expenses, and without telling landowners that the money is being withheld. Significant amounts of fuel are never sold at all – companies use it themselves to power equipment that processes gas, sometimes at facilities far away from the land on which it was drilled. In Oklahoma, Chesapeake deducted marketing fees from payments to a landowner – a joint owner in the well – even though the fees went to its own subsidiary, a pipeline company called Chesapeake Energy Marketing. The landowner alleged the fees had been disguised in the form of lower sales prices. A court ruled that the company was entitled to charge the fees. Costs such as these are normally only documented in private transactions between energy companies, and are almost never detailed to landowners. To keep royalties low, companies sometimes set up subsidiaries or limited partnerships to which they sell oil and gas at reduced prices, only to recoup the full value of the resources when their subsidiaries resell it. Royalty payments are usually based on the initial transaction. In other cases, companies have bartered for services off the books, hiding the full value of resources from landowners. In a 2003 case in Louisiana, for example, Kerr McGee, now owned by Anadarko Petroleum, sold its oil for a fraction of its value – and paid royalties to the government on the discounted amount – in a trade arrangement for marketing services that were never accounted for on its cash flow statements. The federal government sued, and won. The government has an arsenal of tools to combat royalty underpayment. The Department of Interior has rules governing what deductions are allowable. It also employs an auditing agency that, while far from perfect, has uncovered more than a dozen instances in which drillers were “willful” in deceiving the government on royalty payments just since 2011. A spokesman for the Department of Interior’s Office of Natural Resources Revenue says that over the last three decades, the government has recouped more than $4 billion in unpaid fees from such cases. There are few such protective mechanisms for private landowners, though, who enter into agreements without regulatory oversight and must pay to audit or challenge energy companies out of their own pockets. ProPublica made several attempts to contact Chesapeake Energy for this article. The company declined, via email, to answer any questions regarding royalties, and then did not respond to detailed sets of questions submitted afterward. The leading industry trade group, the American Petroleum Institute, also declined to comment on landowners’ allegations of underpayments, saying that individual companies would need to respond to specific claims. Anderson acknowledged that many landowners enter into contracts without understanding their implications and said it was up to them to do due diligence before signing agreements with oil and gas companies. Gas flows up through a well head on Feusner’s property, makes a couple of turns and passes a meter that measures its volume. Then it flows into larger pipes fed by multiple pipelines in a process the industry calls “gathering.” Together, the mixed gases might get compressed or processed to improve the gas quality for final sale, before feeding into a larger network of pipelines that extends for hundreds of miles to an end point, where the gas is sold and ultimately distributed to consumers. Each section of pipeline is owned and managed by a different company. These companies buy the gas from Chesapeake, but have no accountability to Feusner. They operate under minimal regulatory oversight, and have sales contracts with the well operator, in this case Chesapeake, with terms that are private. Until Chesapeake sold its pipeline company last winter, the pipelines were owned by its own subsidiaries. As in many royalty disputes, it is not clear exactly which point of sale is the one on which Feusner’s payments should be based – the last sale onto the open market or earlier changes in custody. It’s equally unclear whether the expenses being charged to Feusner are incurred before or after that point of sale, or what processes, exactly, fall under the term “gathering.” Definitions of that term vary, depending on who is asked. In an email, a spokesperson for Chesapeake declined to say how the company defines gathering. Making matters more complicated, the rights to the gas itself are often split into shares, sometimes among as many as a half-dozen companies, and are frequently traded. Feusner originally signed a lease with a small drilling company, which sold the rights to the lease to Chesapeake. Chesapeake sold a share of its rights in the lease to a Norwegian company, Statoil, which now owns about a one-third interest in the gas produced from Feusner’s property. Chesapeake and Statoil pay him royalties and account for expenses separately. Statoil does not deduct any expenses in calculating Feusner’s royalty payments, possibly because it has a different interpretation of what’s allowed. Once the gas is produced, a host of opaque transactions influence how sales are accounted for and proceeds are allocated to everyone entitled to a slice. The chain of custody and division of shares is so complex that even the country’s best forensic accountants struggle to make sense of energy companies’ books. Feusner’s lease does not give him the right to review Chesapeake’s contracts with its partners, or to verify the sales figures that the company reports to him. Pennsylvania – though it recently passed a law requiring that the total amount of deductions be listed on royalty statements – has no laws dictating at what point a sale price needs to be set, and what expenses are legitimate. Concerns about royalties have begun to attract the attention of state legislators, who held a hearing on the issue in June. Some have acknowledged a need to clarify minimum royalty guarantees in the state, but so far, that hasn’t happened. Because so many disputes come down to interpretations of contract language, companies often look to courts for clarification. Not many royalty cases have been argued in Pennsylvania so far, but in 2010, a landmark decision, Kilmer v. Elexco Land Services, set out that the state’s minimum royalty guarantee applied to revenues before expenses were calculated, and that, when allowed by leases, energy companies were free to charge back deductions against those royalties. Since then, Pennsylvania landowners say, Chesapeake has been making larger deductions from their checks. (The company did not respond to questions about this.) In April, Feusner’s effective royalty rate on the gas sold by Chesapeake was less than 1 percent. Paul Sidorek is an accountant representing some 60 northeastern Pennsylvania landowners who receive royalty income from drilling. He’s also a landowner himself – in 2009, he leased 145 acres, and that lease was eventually sold to Chesapeake. Well aware of the troubles encountered by others, Sidorek negotiated a 20 percent royalty and made sure his lease said explicitly that no expenses could be deducted from the sale of the gas produced on his property. Yet now, Sidorek says, Chesapeake is deducting as much as 30 percent from his royalties, attributing it to “gathering” and “third party” expenses, an amount that adds up to some $40,000 a year. Landowners, lawyers, legislators and even some energy industry groups say Chesapeake stands out for its confusing accounting and tendency to deduct the most expenses from landowners’ royalty checks in Pennsylvania. “They’ve had a culture of doing cutthroat business,” said Jackie Root, president of Pennsylvania’s chapter of the National Association of Royalty Owners. Chesapeake did not respond to questions on whether its approach differs from that of other companies. Several landowners said that not only do deductions vary between companies using the same gas “gathering” network – sales prices do as well. On Sidorek’s royalty statements, for example, Chesapeake and Statoil disclose substantially different sales prices for the same gas moved through the same system. “If Statoil can consistently sell the gas for $.25 more, and Chesapeake claims it’s the premier producer in the country, then why the hell can’t they get the same price Statoil does for the same gas on the same day?” Sidorek wondered. He thinks Chesapeake was giving a discount to a pipeline company it used to own. Chesapeake did not respond to questions about the price discrepancy. Chesapeake may be the focus of landowner ire in Pennsylvania, but across the country thousands of landowners have filed similar complaints against many oil and gas producers. Publicly traded oil and gas companies also have disclosed settlements and judgments related to royalty disputes that, collectively, add up to billions of dollars. In 2007, a jury ordered a Chesapeake subsidiary to pay $404 million, including $270 million in punitive damages, for cheating a class of leaseholders in West Virginia. In 2010, Shell was hit with a $66 million judgment, including $52 million in punitive fines, after a jury decided the company had hidden a prolific well and then intentionally misled landowners when they sought royalties. The judgment was upheld on appeal. Since the language of individual lease agreements vary widely, and some date back nearly 100 years, many of the disagreements about deductions boil down to differing interpretations of the language in the contract. In Pennsylvania, however, courts have set few precedents for how leases should be read and substantial hurdles stand in the way of landowners interested in bringing cases. Pennsylvania attorneys say many of their clients’ leases do not allow landowners to audit gas companies to verify their accounting. Even landowners allowed to conduct such audits could have to shell out tens of thousands of dollars to do so. When audits turn up discrepancies, attorneys say, many Pennsylvania leases require landowners to submit to arbitration – another exhaustive process that can cost tens of thousands of dollars. Arbitration clauses can also make it more difficult for landowners to join class action suits in which individuals can pool their resources and gain enough leverage to take on the industry. All of these hurdles have to be cleared within Pennsylvania’s four-year statute of limitations. Landowners who realize too late that they have been underpaid for years – or who inherit a lease from an ailing parent who never bothered to check their statements – are simply out of luck. Even if a gas company were found liable for underpaying royalties in Pennsylvania, it would have little to fear. It would owe only the amount it should have paid in the first place; unlike Oklahoma and other states, Pennsylvania law does not allow for any additional interest on unpaid royalties and sets a very high bar for winning punitive penalties. Abrahm Lustgarten covers energy, water, climate change and anything else having to do with the environment for ProPublica.